The car industry is going through two massive evolutions right now, on one hand you have the electrification of the drive train and on the other hand you have the nascent self-driving car technology. The latter just came in the spotlights as the US announced the first fatality in a wreck involving a self-driving car. According to the latest reports, the Tesla Model S of 40-year old Joshua D. Brown of Canton, Ohio failed to distinguish the white side of a turning tractor-trailer from a brightly lit sky. The Tesla car went underneath the trailer of the truck, which destroyed the windshield, passed through two fences and finally hit a telephone pole about 100 feet south of the road. Brown's published obituary described him as a member of the Navy SEALs for 11 years and founder of Nexu Innovations, working on wireless Internet networks and camera systems. In Washington, the Pentagon confirmed Brown's work with the SEALs and said he left the service in 2008.Brown was an enthusiastic booster of his 2015 Tesla Model S and in April credited its sophisticated Autopilot system for avoiding a crash when a commercial truck swerved into his lane on an interstate. He published a video of the incident online. "Hands down the best car I have ever owned and use it to its full extent," Brown wrote. 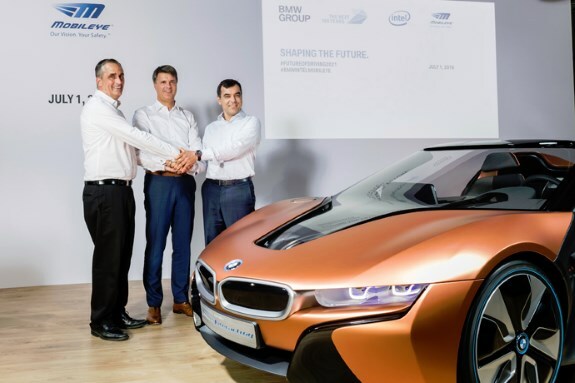 Intel announced it's cooperating with BMW Group and Mobileye to make fully autonomous driving a reality by 2021. The three companies want to make a "level 5" open platform, this means self-driving cars without the need for a human to keep his hands on the wheel and eyes on the road. An early prototype is expected later this year and larger-scale tests are scheduled for 2017. BMW will implement the technology into its iNEXT vehicle, before before making it the basis of its entire fleet. The platform will be shared with other companies and is intended not only for traditional cars but also for shared vehicles and any industry that can benefit from it. Intel is a company that powers the cloud and the billions of smart, connected computing devices that connect to it. As we continue our transformation to focus more deeply on the virtuous cycle that has emerged -- the cloud and data center, the Internet of Things, accelerators like memory and FPGAs, all bound together by connectivity and enhanced by the economics of Moore’s Law -- we are seeing more and more experiences that can be transformed by our technology. The driving experience is perfectly positioned for the next wave of technological innovation. Today, driving can be frustrating: Think of the last time you were stuck in a traffic jam or lost on your way to a destination. Driving can also be dangerous. Every year, more than 30,000 people in the U.S. die from preventable automobile accidents. More than 90 percent of all auto accidents are caused by human error. An EU study reports that distracted and drowsy driving are responsible for 13 percent of traffic deaths each year. These frustrations and dangers make the driving experience ripe for disruption and innovation. Today is an important step in bringing our vision to reinvent the driving experience. To make this vision a reality, cars -- and everything they connect to -- will need super-powerful, secure and reliable electronic brains that make them smart enough to act like human drivers. These are challenges that the auto and tech industries and other experts are coming together to solve. It will take significant resources and our best engineering minds -- and it will not be easy.